The words people use say a lot about them. Some words say that they are smart, persuasive, and informed. Others say that they don't know what they're talking about. Knowing which words to use and how to use them are keys to getting the most from one's mind and to communicating effectively. 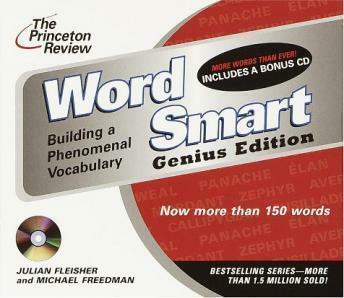 Based on the best-selling book, Word Smart will help listeners learn the words they absolutely need to know. To find these words, The Princeton Review researched the vocabularies of educated adults. It analyzed newspapers like The New York Times and the Wall Street Journal, books from best-sellers to the classics, and standardized tests like the SAT and GRE. The words included in this program are those that appear most frequently and are often misused or misunderstood. Interesting presentation of vocabulary words, though the words presented are not essential for typical prose. For instance, when was the last time that the adverb "niggardly" was ever used by anyone in the real world? Still, I recommend the audiobook.